A young Turkish woman, Zeynep Yukselen, visited us at New England Aikikai last year. She brought with her a message from Mustafa Aygun, her Sensei in Istanbul (www.aikidoturkey.org), a request that I write about my life with Kanai Sensei. That is when I began to write down some of my memories of our life together. It was not easy to write this article and I thank Aygun Sensei and Zeynep for their interest and encouragement.I first spoke with Kanai Sensei on the telephone after New England Aikikai was recommended to me by one of his old students, Eddie Christian. We discussed general information about the dojo but it was difficult for me to understand him. As we struggled through our first conversation, I somehow knew that I was going to join the dojo. That afternoon I walked into New England Aikikai and without so much as a glance toward the mat in advance, I bought a gi and began practice and a whole new life twenty six years ago on June 5, 1980. 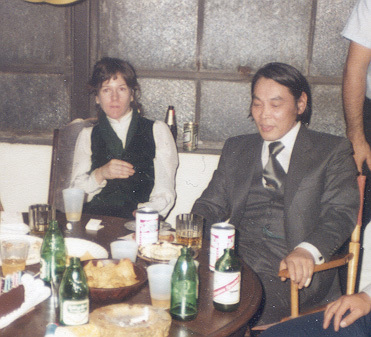 In February, 1982, I went along with a few people from New England Aikikai who drove down to New York City in a van for a Black Belt seminar. I'll never forget that ride. In a blinding snow storm, other cars sliding off the road on either side of us, we pushed on through and made it to New York in record time. Since I was only about a 4th Kyu at the time, this was by far the closest I had come, in my limited Aikido experience, to a total commitment of forward motion! The seminar party that Saturday night was in a loft with huge tables of food laid out for everyone. Kanai Sensei was sitting at a big round table off to the side. I walked over and sat down with him. I wonder sometimes how I had the nerve to do that but it seemed like the right thing to do at the time and I felt comfortable with him right away. Someone took this picture of us sitting there together. We spoke a little and I don't think either of us understood much of what the other said. But I did understand when he asked me to go fishing with him...in May. Being February, our date was still months away, but it was okay with me. 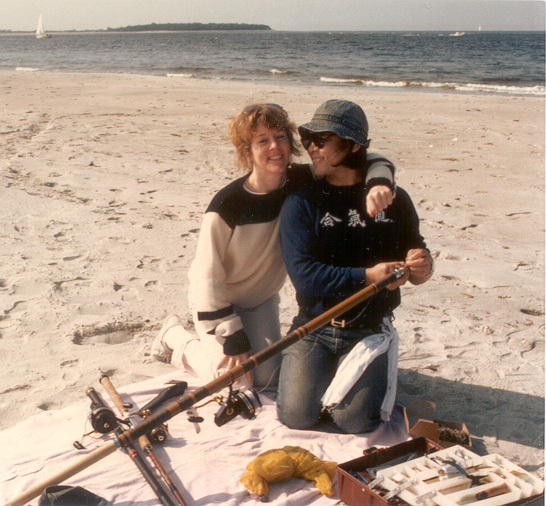 So on a beautiful sunny day in May, we went on our first date, a fishing trip to Cranes Beach in Ipswich, Mass. We caught a lot of 'skate' fish that day, but I also caught my first flounder. I used a tripod and timer on my camera and took these pictures that day. Soon, every weekend we were going to Pigeon Cove in Rockport, a seaport north of Boston, to go snorkeling and spear fishing off Cape Ann. One trip was particularly memorable. We always packed a lunch to bring along in case we didn't catch anything...which was often. This time Sensei had made a big batch of curry to pour over rice. As we walked along the rocks to our favorite spot, Kanai Sensei's face fell as the glass jar of curry he was carrying slipped through the paper bag and smashed onto the rocks. Faced with the possibility of an entire day with nothing to eat Sensei immediately put on his mask and flippers, grabbed his spear gun and dove into the frigid Atlantic Ocean. I sat on the rocks watching, and at times he stayed down under the water so long I wondered if he would ever come up again. He caught flounder and tautog (a fish I had never heard of before) with his spear gun and with his bare hands grabbed lobsters from crevices in the rocks 20 feet below the surface of the water. He brought it all up onto the rocks, filleted the flounder into sashimi, made a fire, and cooked the tautog and lobster right there on the rocks. I don't think we even had matches but somehow he got that fire going. It was the most incredible lunch I had ever had, prepared with the care and love of so many meals we were to have together in the years to come. I knew then that as long as he was around that he would provide for me and protect me, and I knew that this was a guy like no other I had ever met before. So now, twenty six years later, after a life together, and having had two children and everything that goes with that, I wake up every morning and still for a moment wonder if I am only dreaming that he is gone. And then the cold reality of loss and my longing for him take hold of me. He filled up our home with his presence and was such a bright light and inspiration in my life, in the lives of his children and so many others. I think that what keeps him with us now is how much the children and I talk about him. Just about every day we talk about something interesting or funny that he said or did. Yuki was just telling me that one day that while riding in the car with her Dad he told her that he couldn't tell what color the traffic lights were because he was red/green color blind! (I'm glad I did not know that then.) After that whenever she rode in the car with him she would help him by letting him know what color the traffic lights were. There were so many every-day things that he needed help with. Even ordering take-out was difficult for him at times because it was not easy to understand him. While Kanai Sensei loomed so large in the dojo and the world of martial arts it was those little things that he depended on us for. Kanai Sensei was a great cook. While although he preferred the food from his native Japan, and didn't like turkey and the other kinds of food traditionally served for Thanksgiving, he could prepare an amazing gourmet Thanksgiving dinner. He prepared all kinds of great food for the children and me and for dojo friends. I love octopus so occasionally he would buy an entire frozen octopus for the freezer so that we would always have it on hand. He made miso soup and ramen, mochi wrapped in seaweed, sauteed squid, shabu-shabu, sushi and sashimi, tempura and so many other wonderful Japanese dishes. Recently, the children and I reminisced of the extraordinary creativity and inventiveness Kanai Sensei brought to our every day family activities. 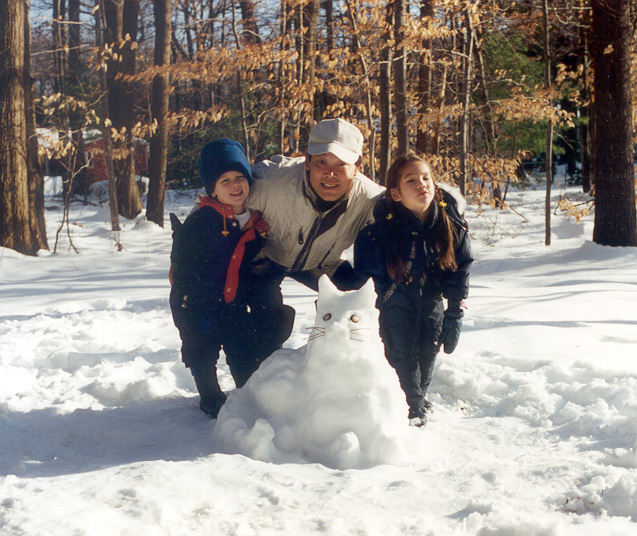 One day, we all went outside to build a snowman and with our help he sculpted a big, beautiful 'snow cat' instead. We remembered the times when he would cut up apples for a snack and carve them into bunnies and birds, and how our Halloween pumpkins all looked like works of art. He also kept a kind of diary of drawings of all of us in caricature depicting funny family stories. Some day I may have them published. He made model airplanes and cars out of cardboard and plastic. The airplanes had propellers that turn and landing gears with little retractable wheels. The cars had windshields, headlights, seats and even door handles. He sculpted a mermaid out of driftwood, etched whales onto scrimshaw, created many beautiful drawings and paintings, and made handles, scabbards and fittings, including tsubas, for his precious collection of swords and tantos. Kanai Sensei was an artistic genius and one of the most revered martial artists in the world. To me he was also a confidant and friend, husband and lover, father, business partner and employer. I will always love him and cherish the time we had together. And he will always be my Sensei.